Ephemeris for Friday, October 12th. The Sun will rise at 7:54. It’ll be up for 11 hours and 8 minutes, setting at 7:03. The Moon, halfway from new to first quarter, will set at 9:31 this evening. The Moon’s changing appearance over the month may seem to be mysterious at first glance. Maybe because one may think that the objects in the sky are somehow different from the familiar objects we see around us on the Earth. In ancient times, especially the Greeks thought that everything in the heavens halfway perfect and spotless. They explained the definite markings we see as the man-in-the-moon as a reflection of the Earth by a spotless Moon. The Moon’s phases are simply light and shadow on a ball in the sunlight. Sometimes, when the Moon appears in the daytime, take a small ball, like a golf ball and hold it up to the Moon, while the ball is also in sunlight, and the small ball will exhibit the same phase as the Moon. One of the best explanation diagrams of the Moon’s phases as it relates to the Earth and Sun. Click on the image to enlarge. Credit Wikimedia user Orion 8. Demonstration of the Moon’s crescent phase with the Styrofoam moon ball we use for Project Astro held up to a light off of the frame to the right. The night side of the ball is illuminated a bit by the translucency of the ball, and the reflection off of my hand. Note the roughness of the ball is visible only at the terminator. 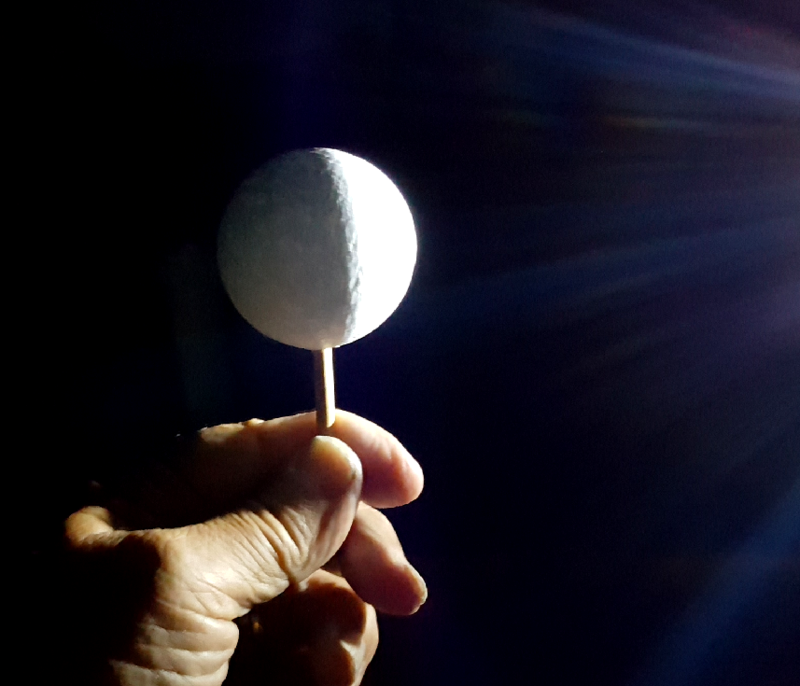 Demonstration of the Moon’s gibbous phase with the Styrofoam moon ball we use for Project Astro held up to a light off of the frame to the right. The night side of the ball is illuminated a bit by the translucency of the ball, and the reflection off of my hand. Note the roughness of the ball is visible only at the terminator. Ephemeris for Tuesday, September 25th. The Sun will rise at 7:33. It’ll be up for 12 hours and 1 minute, setting at 7:34. The Moon, 1 day past full, will rise at 8:17 this evening. 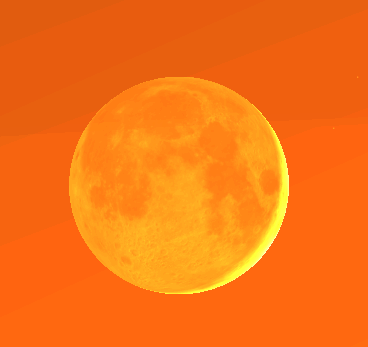 The full, or nearly full moon, just rising, looks like a large orange pumpkin. The color, like the red of the sunset is caused by the scattering out of blue light by the atmosphere. It can happen at any full moon, not just the Harvest Moon, which was officially yesterday. What the Moon around the Harvest Moon does do is rise only a little later each evening. This helped the farmers in earlier times extend daylight to bring in the crops. On average the moon rises or sets 50 minutes later each night. However when the Moon is in the part of the sky where it is moving northward as well as eastward, then it rises only a little later each night. Tomorrow’s Moon will rise only 27 minutes later than it will this evening. The harvest moon effect 2018 showing the shallow path of the Moon near moonrise and the intervals between them for 5 consecutive dates. Created using Cartes du Ciel (Sky Charts). Ephemeris for Thursday, September 13th. The Sun will rise at 7:19. It’ll be up for 12 hours and 37 minutes, setting at 7:57. 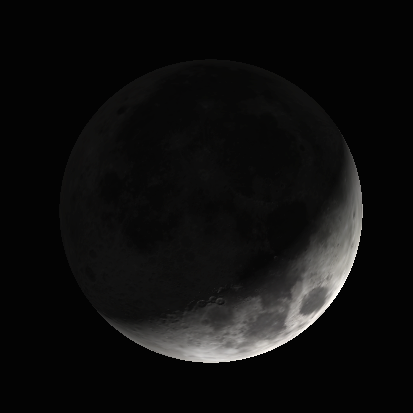 The Moon, 3 days before first quarter, will set at 10:27 this evening. The Moon tonight is a 4 day old moon, and appears near the planet Jupiter. Day one is its first appearance in the evening after disappearing from the morning sky. 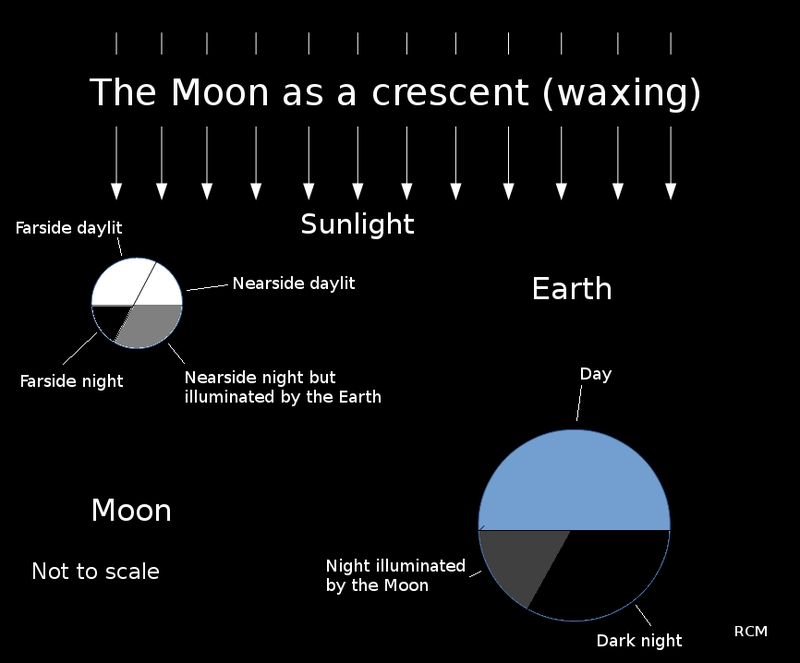 The ancients called it the new moon, but astronomers treat the conjunction of the Moon and the Sun as the new moon. In this program I note the days before or after the nearest quarter phase, as a better representation of the actual appearance of the Moon’s phase. The Moon will be a beautiful crescent tonight. Binoculars will reveal a dark area just above the fattest part of the crescent. It serves as one of the Man in the Moon’s eyes. Its official name is Mare Crisium, or Sea of Crises. Most of the Moon’s seas are connected, or appear to be. This one is definitely not. The 4 day old Moon showing Mare Crisium, the Sea of Crises. 9 p.m. September 13, 2018. 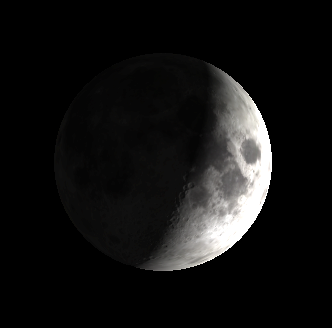 Created using Virtual Moon Atlas. Ephemeris for Tuesday, September 11th. The Sun will rise at 7:16. It’ll be up for 12 hours and 43 minutes, setting at 8:00. The Moon, 2 days past new, will set at 9:27 this evening. Venus, the Moon and Jupiter at 8:30 p.m. September 11, 2018. Created using Stellarium. An overly colored Moon to bring out Earth shine on thye evening of September 11, 2018. Created by Stellarium. Overly processed in GIMP. Ephemeris for Thursday, August 16th. The Sun rises at 6:46. It’ll be up for 14 hours exactly, setting at 8:46. The Moon, 2 days before first quarter, will set at 11:59 this evening. 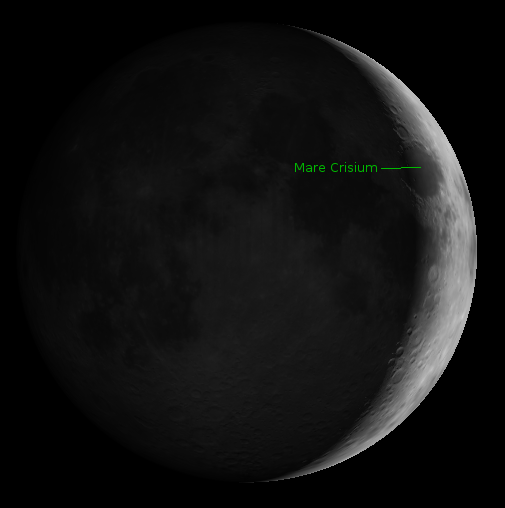 With the Moon at a fat crescent tonight, it’s a good time to turn binoculars or a small telescope toward it. The demarcation between the bright part and the dark part is called the terminator. In the case before full moon, it is the sunrise line. After that the sunset line. The Moon’s entire day lasts about 29 ½ earthly days. I am sometimes asked “What’s blocking the light from the unlit side of the Moon?” It’s the Moon itself. It’s the night side of the Moon, just as when we are in night. The Earth itself is blocking the Sun’s light from us. The Moon, like the Earth and all the other planets are spheres lit on one side by the Sun. It’s near the terminator of the Moon where the most detail is revealed by the long shadows cast by the Moon’s features. The crescent moon as it should appear tonight. Created using Stellarium. Stellarium always shows details on the night side of the Moon. 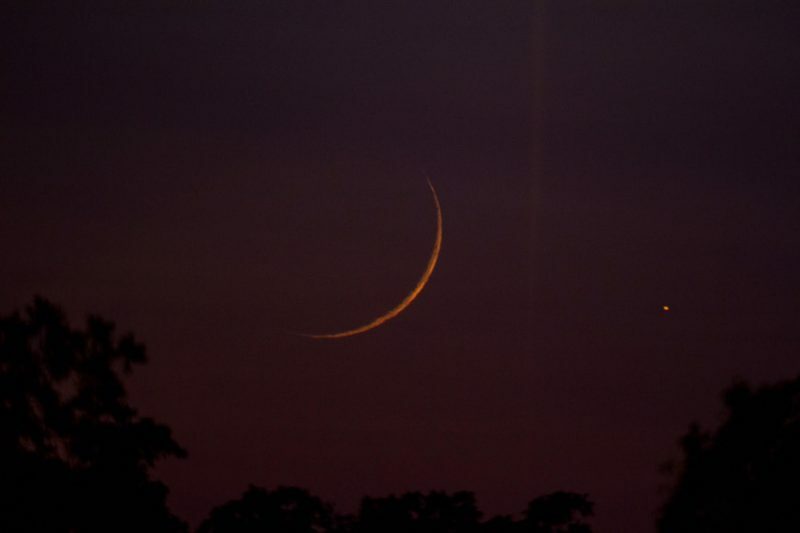 The crescent phase of the Moon is now too fat to really see earthshine on it’s night side. 05/26/2017 – Ephemeris – Can you spot the extremely young Moon tonight? Ephemeris for Friday, May 26th. Today the Sun will be up for 15 hours and 11 minutes, setting at 9:15, and it will rise tomorrow at 6:03. The Moon, 1 day past new, will set at 10:16 this evening. It’s spring and a great time to see if you can spot the young moon. The official time when the moon was new was 3:44 p.m. yesterday afternoon (19:44 UT 25 May 2017), which would make the moon a bit less than 31 hours old if spotted before it sets an hour after the Sun. This requires crystal clear skies and a very low northwestern horizon. Binoculars are a definite help. Spotting the earliest moon after new moon is one of the challenges amateur astronomers pit their observing skills with. Another is the Messier Marathon, in which one tries to observe all 110 of Charles Messier’s catalog entries of dim objects on a single night, which is theoretically possible around March 24th. A 39 hour old Moon with Jupiter taken by Greg Hogan on September 2, 2016.